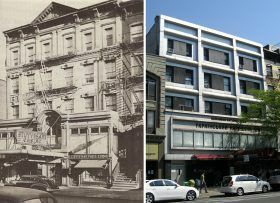 Earlier this month, GVSHP launched its East Village Preservation effort, releasing its new website “East Village Building Blocks,” which contains historic information and images for every one of the neighborhood’s 2,200 buildings. Of course, any neighborhood spanning five centuries of history and nearly 100 blocks will reveal some surprises when you scratch the surface. But the East Village’s story has some unique and unexpected twists and turns which are brought to light by this new online tool. From the birthplace of the shag haircut to four former homes of Allen Ginsberg to the first federally-subsidized public housing project in America, here are just a few of those you’ll encounter. On 2nd Avenue, just south of 9th Street at No. 140-142, sits one of the East Village’s oddest structures. Clad in metal and adorned with Cyrillic lettering, the building sports a slightly downtrodden and forbidding look, seeming dropped into the neighborhood from some dystopian sci-fi thriller. In reality, for the last half century the building has housed the Ukrainian National Home, best known as a great place to get some good food or drink. But scratch the surface of this architectural oddity and you’ll find a winding history replete with Jewish gangsters, German teetotalers, jazz-playing hipsters, and the American debut of one of Britain’s premier post-punk bands, all in a building which, under its metallic veneer, dates back nearly two centuries.